On September 23, 2013, the president of Serbia Tomislav Nikolic unveiled a new monument to Nikola Tesla on the compounds of Tesla’s former Wardenclyffe laboratory on Long Island. 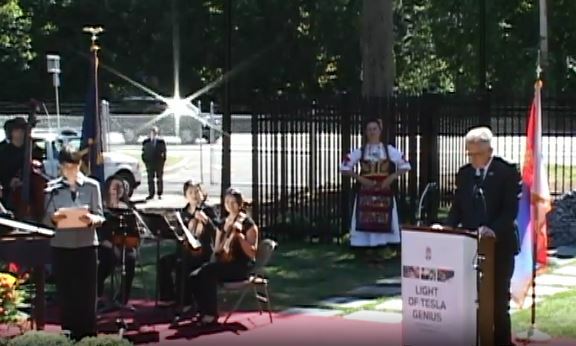 A large number of Serbian diaspora and other fans of Tesla listened to a dozen speeches, prayers, songs, and music; to raise Tesla’s profile and maybe to have a place to worship the inventor eternally. For a good read about the complex ‘Tesla worshipping’ I recommend http://paleofuture.gizmodo.com/making-nikola-tesla-a-saint-makes-us-all-dumber-1308034624. May Tesla R.I.P.